I’m fresh off the giant craft-room switch (tons of carrying boxes and card catalogs around, along with an aqua painting session) and we’re getting noisy new ceilings put in upstairs, so my laptop time is a little crazy this week. I just posted about lots of things I’m excited about at my World of Geekcraft site and I hope you don’t mind a cross-post over here… Thanks so much to everyone who has had kind words (or cool projects) to share on the WOGC side of things, I’m so appreciative. 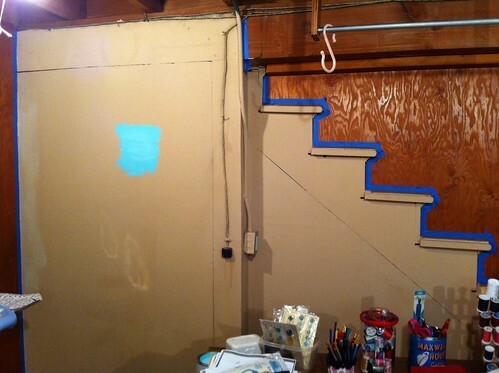 Back to the craft room for a second, here is a “during” photo (I just couldn’t deal with the “before” stage) – my first swatch of Tropicana Cabana over the dingy old-band-aid-colored drywall downstairs! I left the wood as-is and just jumped in for a 1.5-hour painting session. I love the aqua so much. Someday I will proudly be displaying the finished project in our rec room (I have a crazy idea to frame it, which may or may not work, but I’m trying it for sure!). 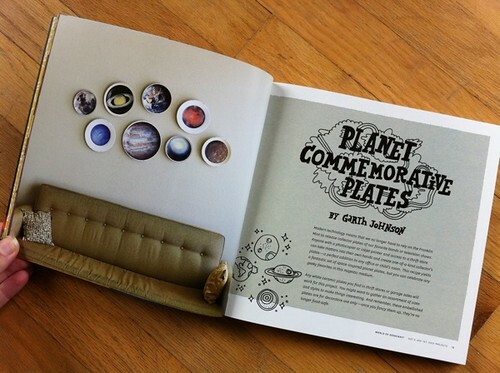 Yay, Etsy has shared Garth Johnson‘s fantastic Planet Commemorative Plates project on their How-Tuesday feature! You can get the full project instructions and details over there. 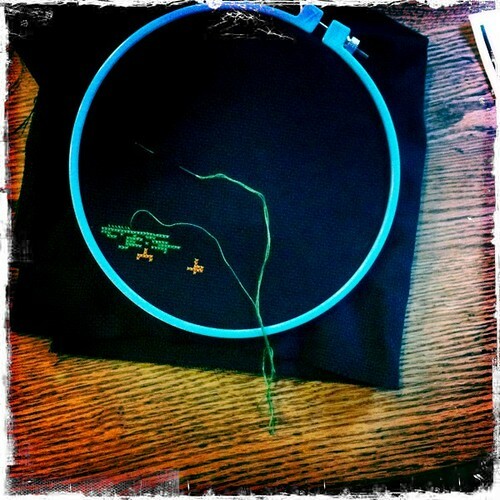 I’d love to see yours if you make them, please add a photo to the WOGC flickr group. And my awesome publisher, Chronicle Books, is giving away a copy of WOGC to commemorate the end of the epic Harry Potter movie series. 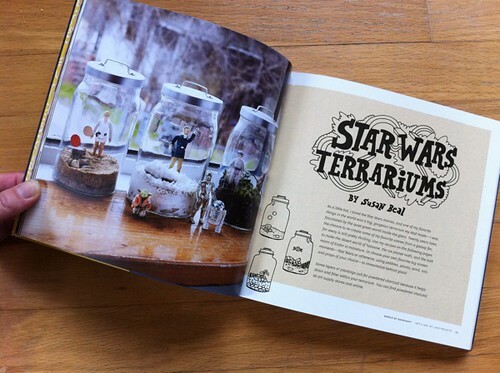 I’m excited that a feature on the Star Wars Terrariums will go up on CraftFoxes soon too. For now, you can see some lovely preview photos from our terra-crafting session on Katelyn’s Creo Photography blog. There’s some other good terrarium news to share soon too, I’ll keep you posted! Finally, WOGC has gotten some nice reviews lately! 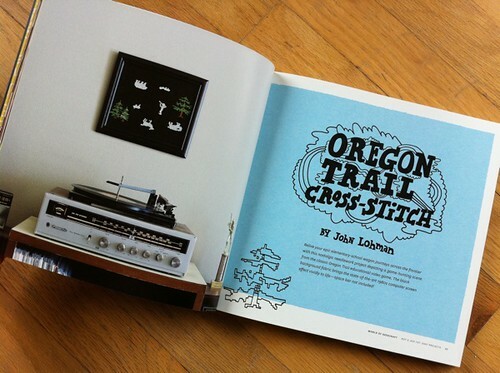 Special thanks to Jane Ritter of the School Library Journal for her post last month. I loved making things in high school, and it is so cool to imagine my book on a school library shelf. Beal’s introduction declares, “We’ve come a long way since ‘geek’ meant a carnival sideshow freak,” which sets the playful tone of this book. 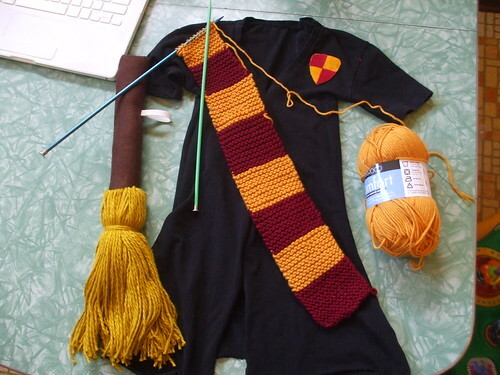 To celebrate the geek in all of us, the author has pulled together 25 projects from a variety of crafters organized by difficulty starting with “Not a Jedi Yet” (easy) to “Warp Speed” (advanced). 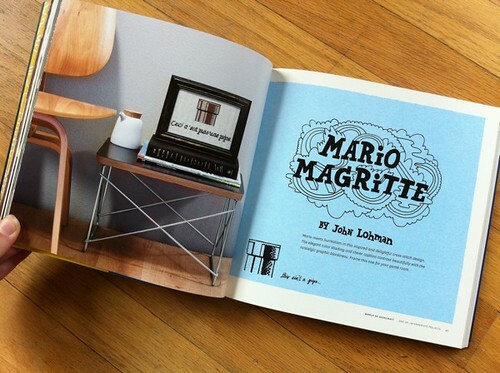 Each contributor includes a “best geeky memory” that often highlights a video game, Star Wars or Star Trek, or an early computer memory. Each project lists the necessary items and includes clear, detailed instructions. Accompanying photos add to the fun. According to Charlie McConnell, a geek is made up not only of flesh and blood, but of awesome. I agree with this. Geeks are awesome. 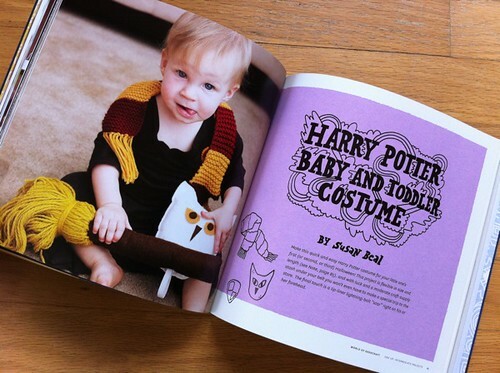 So is this book, World of Geekcraft. It has lots of awesome projects. Some are difficult and need time and effort to complete but if you use time and effort, the projects will come out beautifully. Get this book if you want to be awesome. “After” craft room photos soon! Love the color, Susan! Excited to see it in person soon!